Mark with the pencil on the top of each plate, a line showing where the front of the baseplate of each truck will fall. Around a quarter of an inch ahead of this, along the centreline, mark and drill a 3/16" hole at an angle, approx. 30 degrees to the horizontal. This is where the Nose Stop assemblies will be attached (Photo 17). Using the hacksaw, cut two sections from the 1" diameter metal tube. File carefully to remove sharp edges. Cut two pieces of dowel to fit inside the tube sections and drill a 3/16" hole down the centre of each. Bolt the two tube pieces (with dowel inserted), one to the front of each aluminium plate, using the two 2" by 3/16" bolts, two large flat washers, the two doorstops and the two standard nuts (with a small washer apiece, if necessary). The Nose Stop assembly is now complete (Photos 18 & 19). Bolt the four trucks, the two plates and the two blocks to the soles of the boots as shown. Use the 16 countersunk bolts – trim down any excess length – and tighten the assembly together using the 16 locknuts (Photo 20). Replace any inner soles the boots may have had – extra cork inner soles may be a good idea for added comfort. Bolt on the 8 wheels – and the job's done (Photos 21 & 22). Finally, as an added construction tip, if at any time there proves to be an unacceptable degree of flex in the boots between the toe and heel trucks, the problem can be solved by the addition of torsion bars. Such bars could be cut from, say, the same 10 gauge aluminium, and be around an inch in width. Holes drilled at the ends of the bars would slide onto the kingpin of each pair of trucks – to be positioned beneath the lower rubber's retaining cups. 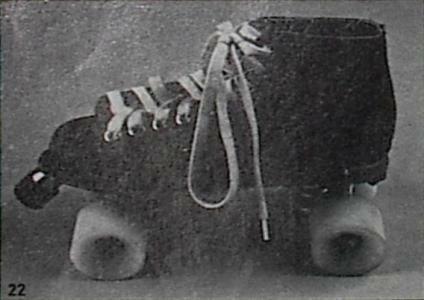 Could this be a revolution for all you roller skaters? No longer must you be confined to the dizzying circles of the roller rink. You are now free to fly, flow and travel anywhere you like. The horizons are virtually unlimited. You can freestyle, you can slalom. Downhill is an insane rush – without that old enemy, speed-wobble. And bowl riding is pure exhilaration, if you have the guts of a madman and the sense of a bird.